■Makeup (Lashes): ~Shiny Stuffs~ Madly Beautiful CATWA Appliers @Enchantment NEW! ■Hair: =DeLa*= Mesh Hair “Alice” @Enchantment NEW! 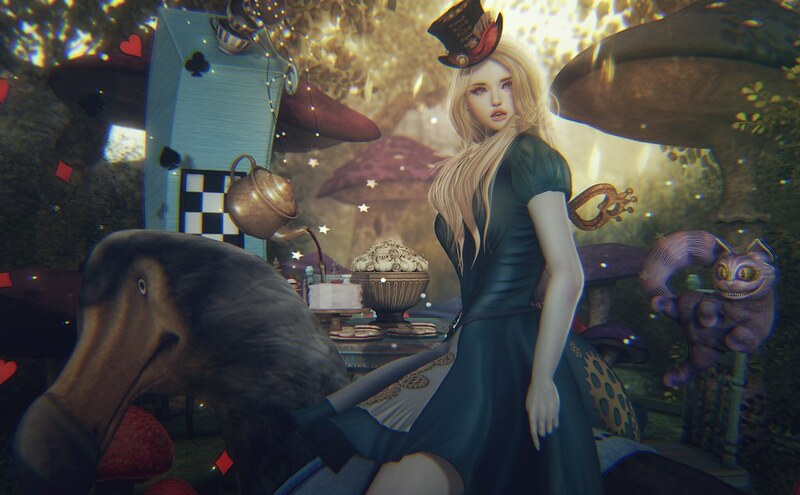 ■Outfit: Infinity Alice Gacha @Enchantment NEW! ■Cat: *HEXtraordinary* Cheshire Cat Companion @Enchantment NEW! ■Trees: Titans – ThisWayThatWay Tree @Enchantment NEW! ■Mushrooms: Raindale – Wonderland mushrooms @Enchantment NEW! ■Cabinet: MOoH! Alice Cabinet @Enchantment NEW! ■Sweets: DISORDERLY. / Elegant Mess Gacha @Enchantment NEW! ■Poker Symbols: Puke Rainbows Store [PR] Poker Symbols @Enchantment NEW! ■Table Set: BackBone Shabby Chic @Deco(C)rate NEW!